JibJab is an awesome place to work – not only because of the recent installment of a free soda machine or the fact our laundry gets clean every week, but because we are allowed to extend our creative minds. Last week the executive team surprised us with a new initiative they like to call JIBJAB: LAB. In this exercise, we were allowed two days to create a project of our liking and present what we came up with to the entire team. With the overwhelming amount of talent we have here at JibJab it is probably no surprise the two-day innovation-fest was an incredible success. It would be impossible to share all of the amazing projects, but take a look below. Bennett figured out a way to take a picture of someone from their iPhone & directly insert it into a JibJab postable, then display online: Instajab. Cat lovers Glennie and Nicole created an entire JibJab page dedicated to cats – “Starring Mew”. It even included a live Twitter stream using the hashtag #jibjabcats. Dave and Robbie worked overtime on their project & completed a heavy metal re-make of the now infamous YouTube video “Friday” by Rebecca Black. When we say heavy metal, we mean heavy metal – as we were watching the video one of the office speakers blew out! They recorded the track and made the video out of paper cut out puppets. Check it out here. 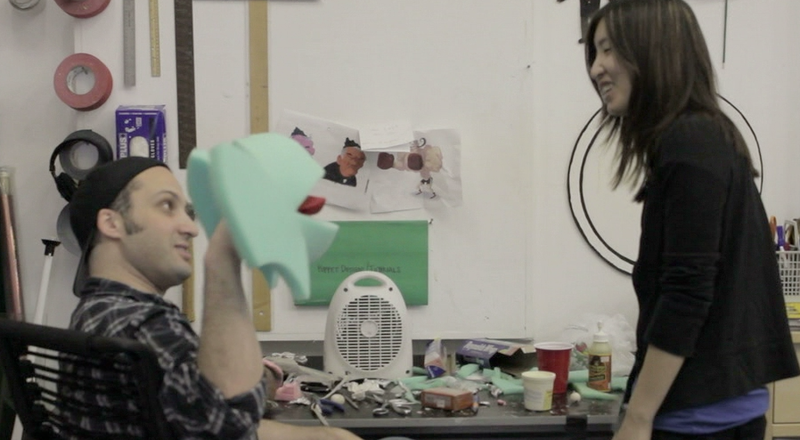 It wouldn’t have been a JIBJAB: LAB without some puppet making – both Mike and Amy made characters! All in all it was a great experience! Some people even stepped out of their comfort zone and created something they had never done before, leaving the entire team very impressed. So now the cobwebs are dusted out of our brains and we are back to working hard to bring our creativity and innovation to you! This entry was written by paulhanges and posted on May 17, 2011 at 3:20 pm and filed under Inside JibJab. Bookmark the permalink. Follow any comments here with the RSS feed for this post. Trackbacks are closed, but you can post a comment. I also must see if I can fix the problem of no longer being able to connect with Facebook to post my JibJab creations to each friend I choose! I am a paid member on JJ and sure miss being able to do this. I ASSUMED it was due to that new laptop having Windows 7 on it instead of Vista>? Company cultures that embrace hackathons and mini Startup Weekends will absolutely keep the fun and mojo flowin’, not that JibJab is in ANY risk of losing that.. I love the projects that resulted, my favorite being Heavy Metal Friday! Maybe in the future you can find ways to connect to the local community through a hands on event, collaborating and teaching others how to get out of their own comfort zones with being creative. You guys own the space in the digital realm and do so in a very analog production way, but it would be great to see you interact in an analog way with the people that love your products. Just about all the jib jabs that I’ve had a chance to work with has been so much fun. 1) “The Monster Mash” Was really a thrill. Keep On Doing The Great Work. Thank You So Much Jib Jab. i love it so much.. its really soooo funny..
i think you shoud expand your jib jabbin horizons and create a jib jab feature for dogs and cats- or pets in general. that would be hilarious. i just want to make request maybe you can extend your ideas to a more of a girl group vids…more on dancing videos cause it really rocks. anyways…you guys rulezzz!! !i love jibjab!!!! I agree—more dances and MORE VIDEOS! That is the fun part of JibJab–being able to incorporate 4,5,6,or more peoples’ heads into the videos! The pictures are nice,,,,but not as much fun! I like to become a member of Your comunitee but I had to put via Online my Bank accounts and numbers.Question: Is there are another way of subscription!? Hi Dieter – We currently accept credit card only via our site. Unfortunately we cannot accept other forms of payment such as cash, check, money order, debit cards, gift/prepaid cards, etc. If you have any other questions please email us at help@jibjab.net. Thanks!